I recently watched a movie set in ancient Egypt, and I was inspired by all the gorgeous collar necklaces made of heavy metal chainwork and embellished with precious stones. I used some geometric foam stickers (find them at the dollar store!) 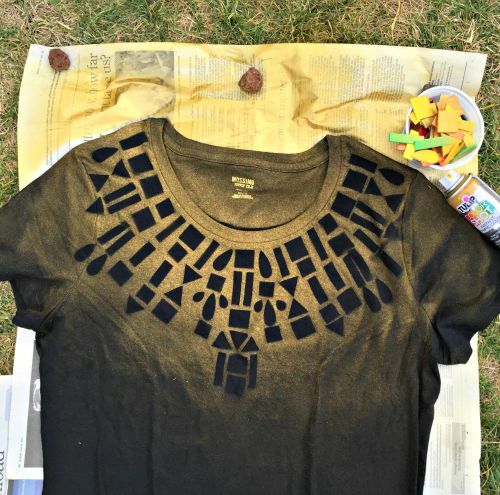 to help me create an Egyptian-inspired t-shirt, which I was able to make in just minutes using gold Tulip Color Shot fabric spray paint. A note about supplies: I frequently find t-shirts at the dollar store (and they are usually good quality, 100% cotton shirts! ), and you can find packages of foam stickers at the dollar store too. 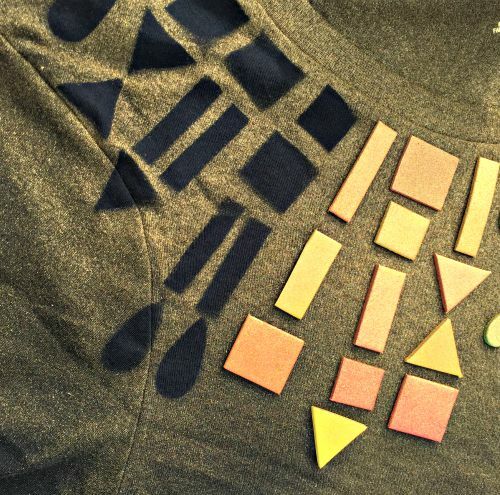 Step 1: Stick foam stickers onto the t-shirt starting from the center point just below the collar, and working your way outward, symmetrically. Step 3: Shake the Tulip Color Shot spray can for at least 1 minute, vigorously. This is a necessary step, so don't skip it. You will also want to shake the can intermittently during the spray paint application. 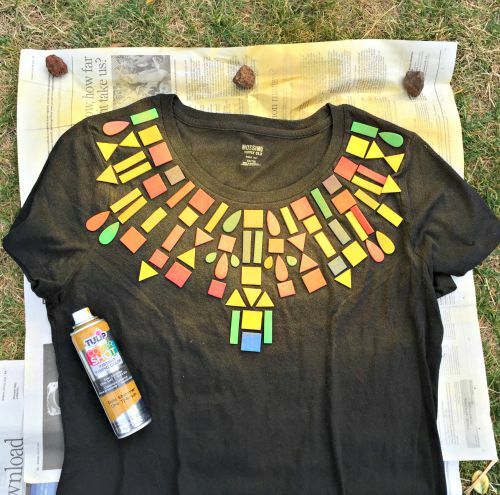 Step 4: Starting from the collar of the shirt, spray lightly outward, radiating from the collar. Repeat with light coats, waiting 5 minutes between coats, until desired intensity is achieved. Note: Once you remove the stickers, the contrast between the painted and unpainted part will be much more distinctive than you think. 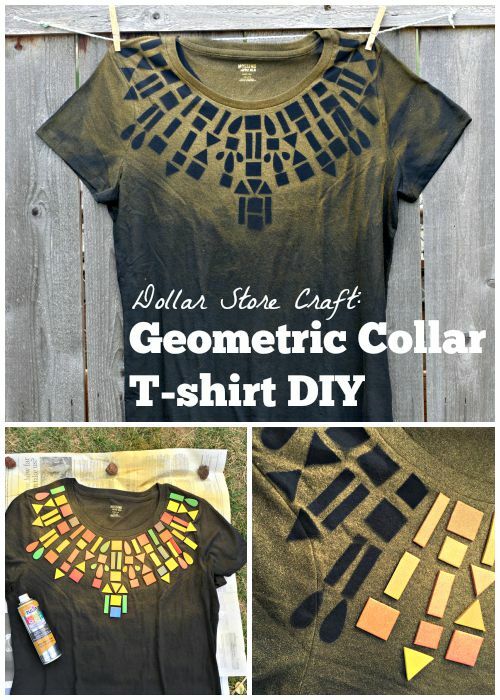 For an ombre look, I concentrated the most intense color near the collar and lightened the paint application as it radiated outward over the collar. Step 5: When you are done with the paint application, wait 15 minutes and then remove the stickers. For easy cleanup, it helps to have a little disposable cup or bowl to put the stickers in after you remove them. 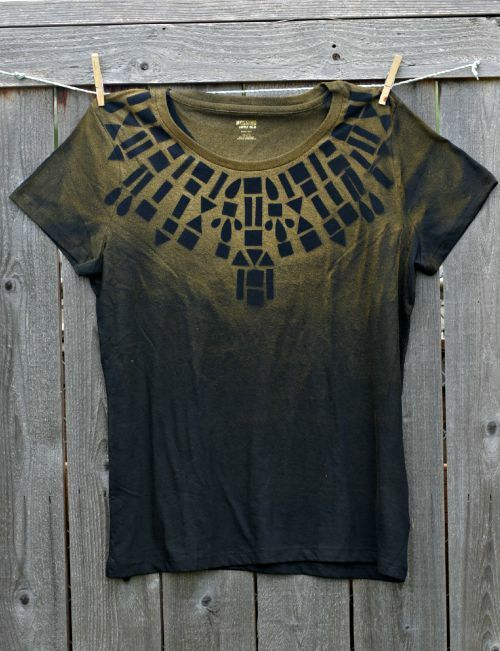 Although it's hard to tell in this photo, the gold spray paint is nice and shimmery, which is really striking on a black t-shirt. 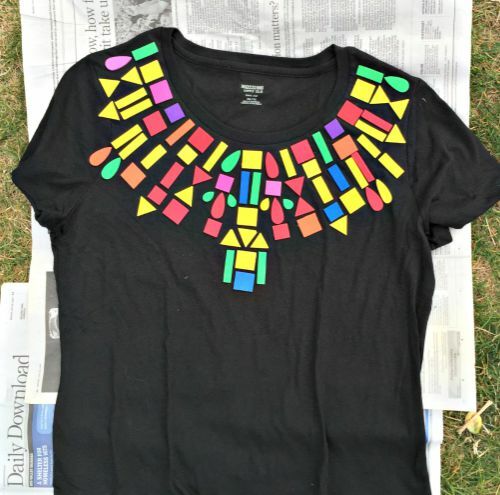 Step 6: Turn the t-shirt over and give an ombre paint job to the top of the back of the t-shirt. Would be cute using pink or silver in place of gold too. Very cute idea that I plan to use! Eu amei sua ideia mas aqui no Brasil onde eu encontro esse spray e esses adesivos!! !